A donut-shaped UFO was captured on video outside the International Space Station shortly before the video feed was mysteriously cut (again!). A few days later, two similar donut UFOs were captured on video over Thailand. Are the sightings related? Are these UFOs part of the same fleet? Is NASA getting even more cautious after astronaut Scott Kelly’s controversial UFO tweet? The donut UFO seen on the ISS camera appears to be the second sighting of a UFO of this unusual shape this month. The first occurred in early November. The UFO disappears shortly after its presence is detected by the space station camera. The second sighting took place on or about November 23rd and it looks like the same or a similar donut UFO. In this case, the video feed from the ISS suddenly goes to blue screen a short time after the UFO is spotted. The second sighting occurred a few days after astronaut Scott Kelly caused a massive stir with his tweet of a photograph from the ISS showing what appears to be a UFO. It took a few days and a lot of clamoring for more information and/or UFO verification before NASA released a report stating that astronaut Kelly’s UFO was a “reflection” in the window of a light behind him in the space station. Why did it take NASA so long to comment? Could that be why the video feed showing the second donut UFO was cut so quickly? Could it be that these two UFOs weren’t reflections? That brings us to the sighting in Thailand. On November 25th, three donut-shaped UFOs were seen and recorded over Bangkok, Thailand. The anonymous witness estimated they were 10 meters in diameter. There are currently no other witness reports and no other information on these UFOs. 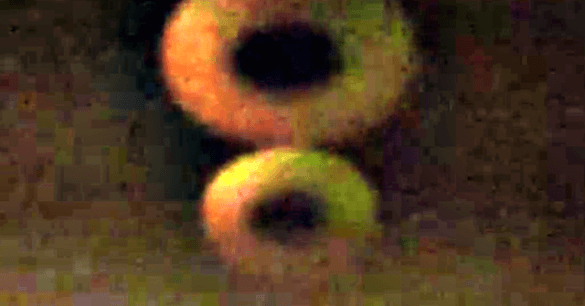 What are these donut or ring-shaped UFOs? Were the ones seen from the ISS reflections or something that NASA doesn’t want the world to see, especially after astronaut Kelly’s photograph? What were the UFOs stacked over Thailand? Another ‘refection’ or CGI? Could they be the same as the ones at the ISS or part of the same fleet? Insert your theory/joke about aliens being galactic police officers who like donuts here.